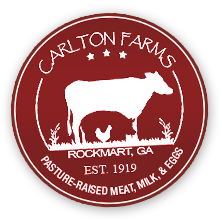 At Carlton Farms, we humanely and organically use domestic animals to produce the nutritious food we provide for our growing population. We do not endorse subjecting our animals to highly confined unnatural conditions in order to increase production. We would rather allow our animals to roam our pastures and exhibit their natural, instinctual behavior. In other words, we want our cows to be able to graze clean, organically managed pastures and lay in the shade to chew their cud; our pigs to root in the dirt and wallow in the mud; and our chickens to be provided protection from weather and predators while still being able to range our pastures, eating forage and bugs. This environment that we provide for them not only makes for happy animals (which, I’m sure it does), but it creates a stress-free lifestyle and allows for a natural, balanced diet for each individual animal. - All of our animals live in a system that provides continuous access to organically managed grass pastures. We believe grass is the primary key to producing healthier meat, milk, and eggs. - This is a tough one. Firstly, we want all our animals to primarily consume their natural diet - grass, bugs, acorns, roots, etc. However, some classes of animals do need feed supplementation: chickens, pigs, and a small amount to dairy cows (beef cows do not receive grain). While we would love to be able to use a certified organic feed for all our animals, virtually no organic grain is produced in our part of the country, making it a cost prohibitive scenario. After spending considerable time developing the next best alternative, we have recently begun to grow our own non-genetically modified corn that we combine using our own formula to create a true locally produced, non-GMO feed. The highest quality organic mineral supplements and organic anti-parasitic ingredients are added to ensure our animals optimal health. While we can’t claim that this is organic, it is lightyears better than commercially available feedstuff. Not to mention, something can be said for the “localness”, as trucking “organic” feed thousands of miles simply doesn’t seem “organic”. We have put a lot of work into the feed we currently use, though we don’t want to become satisfied. We think there is room for some organic grain farmers in the southeast and we would welcome their arrival, but until then we will continue to do the best we can with what God has blessed us with. The feed situation is constantly improving and we would caution you not to let perfection be the enemy of “very good”. - The freshest, most nutritious way to purchase food is directly from the farmer. For that reason, we only sell from our hands to yours. This ensures that you always get the freshest, highest quality food. Because it goes out the door with our name on it, we will make sure it is right. This model also always allows you the opportunity to inquire about the food you are purchasing; how it was raised, seasonal variances, etc. We believe in total transparency, so any question is fair game. Food just tastes better when you personally know the famer producing it.